The Delaware Chapter of Associated Builders and Contractors (ABC) and the Delaware Contractors Association (DCA) presented Wohlsen Construction with three awards for two recently completed projects. Datwyler’s new pharmaceutical manufacturing facility, also known as Project Eagle, received both an Excellence in Construction award from ABC Delaware, as well as a Construction Excellence Award from DCA. This design/build project was completed with project architect, Becker Morgan Group, and spans 223,000 square feet. 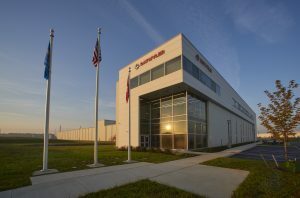 Located in Middletown, DE, the new facility is the Swiss-based firm’s third location in the United States and includes an office, lab, and process facility with custom process equipment developed and manufactured specifically for the plant. The layout incorporates Good and Lean Manufacturing practices and features. Also winning an Excellence in Construction award from ABC Delaware is the Delaware Military Academy’s Anthony N. Fusco Sr. Athletic Center. Designed by Michael McCoy Architects, the new, 26,363-square-foot facility is the first monolithic dome structure in the state of Delaware. 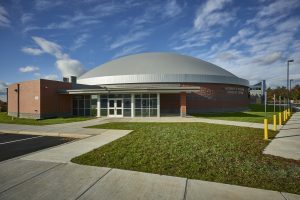 The facility consists of the dome with an exterior wing and houses both athletic and academic spaces, including a basketball arena, weight room, locker rooms, classrooms, and science labs.